The transmission quality of high-speed optical networks is affected by dispersion. Dispersion refers to the degradation of the transmission signal caused by spectral and polarization effects in the optical fiber. The MTS-6000 and MTS-8000 measurement devices and the corresponding measurement module are used to determine dispersion. The ODM module, which works with the MTS-6000 and MTS-8000 base units, combines the following measurements in a single plug-in module: chromatic dispersion (CD), polarization-mode dispersion (PMD), and attenuation profile (AP). For CD measurement, this module uses the patented phase-shift method, which ensures fast and precise measurement results. The fiber can be characterized across the entire wavelength range from 1260 nm to 1640 nm. The measurement of CD, PMD, and AP is required to comprehensively characterize optical fibers. The measurement of polarization-mode dispersion is the most critical parameter to consider when having a fiber approved for the transmission of high data rates. The higher the data rate to be transmitted, the more critical this value becomes. The PMD plug-in module for the MTS-6000 and MTS-8000 base units works with the fixed polarization filter method (fixed analyzer) standardized by the ITU-T, IEC, and TIA/EIA. 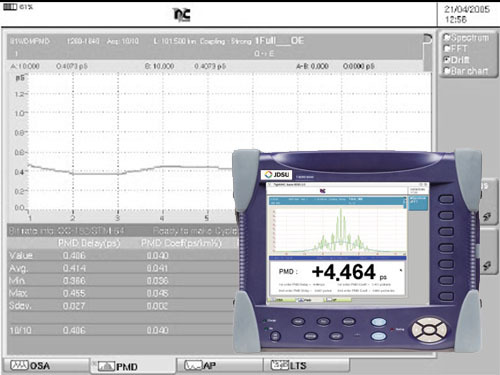 Using the PMD module, the PMD runtimes and the PMD coefficient can be measured and the second-order PMD calculated. This unit can be combined with different handheld broadband light sources. In an optical fiber, chromatic dispersion refers to different runtimes for different wavelengths. They lead to a broadening of the pulse and ultimately a restriction of the transmission range of the optical fiber. Chromatic dispersion is the dominant dispersion in single-mode fibers – it is a material property. If optical fibers are damaged by internal or external influences, the fiber will become birefringent (e.g., when bent or in a misaligned fiber core). The two perpendicular polarization planes have different running speeds, and the pulse broadens. The PMD is a statistical value that can change due to external influences such as a shift, mechanical strain, or temperature fluctuations.